It’s impossible to ever feel like you eat 1% of what you ought to when visiting New York City–especially when you’re on a time crunch like G & I were this last trip. Since three years had passed since I was last there and since I’m no longer a vegan, it was a different ball game than I remember. Not even traveling into Manhattan (except to drive through on our way to Brooklyn and out) on top of not even knowing where exactly I wanted to eat made it fun a wee more adventurous/trusting of others than I’m used to. Friday night after catching Beruit, we hoofed over for a late dinner at the Roebling Tea Room, a nice little restaurant on the northside of Williamsburg. The outside looks a little like that picture–after you’ve had a few of their amazing cocktails. 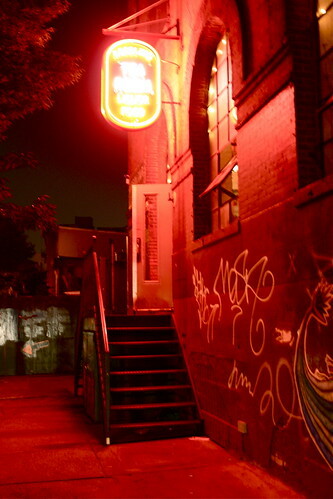 Blurry, warm, inviting (in that industrial/neon light kind of way). No pictures of the cocktails, but I know the first one I ordered was whiskey based and delicious, but the one we all fell in love with was the hibiscus-tequila drink that was slightly margarita-esque, but better than your average or better than average lime one. Can’t go wrong with hibiscus, so light and tangy and refreshing! For dinner we opted to split an arrangement of three dishes–all of which were hard to not just gobble down. First up was the Papparadelle with Italian-style chicories, golden raisins, capers, white anchovy, parmesean, tomato, and salt cod. It was understated and bright, the house-made pasta folding into layers of acidic tomatoes and salty capers, the golden raisins giving just a hint of sweetness when I bit into one. Simple and rustic, the pasta was comforting with just enough twist to make it exciting. And finally, the chicken dish. Lila told us to order this if we ended up at Roebling and I must admit, I’m stoked we followed her suggestion. A total celebration of the chicken, the lightly fried breast and drumette (wee leg?) were so succulent I thought the thing had been injected with juice. 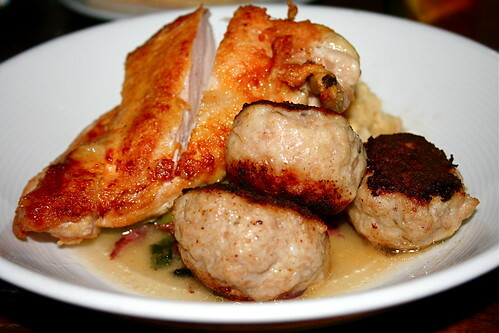 And the dark meat meatballs? Genius. Again, juicy and chicken-y, there’s no other way of describing it. The chicken tasted like actual chicken, not just some dried out low-fat piece of meat on a plate. Oh, and that dumpling–the Southerner in me was giddy with it. It wasn’t gummy or like sawdust, but toothy and perfect when paired with the meatball. Roebling definitely stood up to David’s claims about the drinks–utterly delicious–and I’m glad I didn’t really know anything about it going in since the reviews on Yelp are pretty disappointing compared with my experience. The complaints I’ve read since dining there don’t add up to our meal–the ingredients were superb and the cooking spot-on. 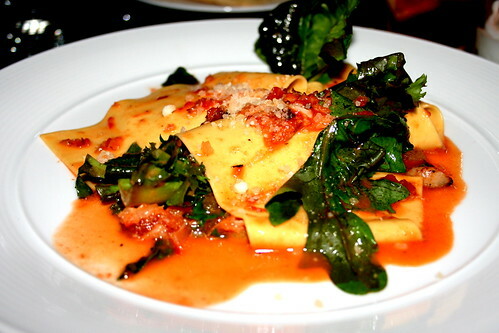 And as for the price–really, New Yorkers complaining about $15-$23 main courses? The restaurant is definitely not overpriced, especially for the portions and the quality. The only bone I’ll gnaw about it was the volume of the music–way way waaaaay too loud. It was almost impossible to talk to each other, and we were seated at a four-top, so I can’t imagine how larger parties manage. But otherwise, a totally enjoyable meal and the best one of the trip. Mmmm…that chicken looks so good! And the dumpling! Seems quite different from the chicken and dumplings I’m used to, but looks wonderful nonetheless. I’ll probably never make it to New York City, but I enjoy very much reading about your travels and eating adventures. Honestly, I think you could just keep on eating non-stop for your whole life, and never hit every restaurant in the city. What with so many opening and closing every month, that’s not such an unrealistic statement. Anyway, quality trumps quantity every time, so I have no problem revisiting restaurants even when so many remain unexplored. Looks like you picked a keeper here. Sounds like a fabulous trip – I love NYC. How were Beirut? They just played in London and I hear it was an amazing show. 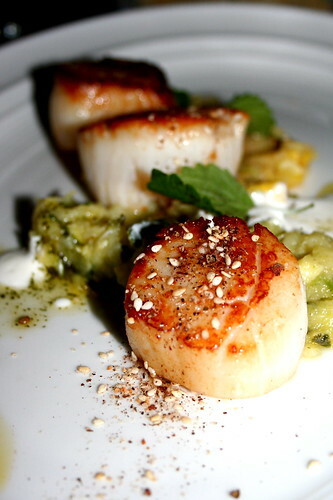 I want to try to make those scallops. Beautiful pics, as always.